Chart of a Farmer as per Astrology. Today, let’s see what planetary placements can make someone a Farmer. The same planetary positions can be seen for someone in real estate, construction or any work related with land. 4th house – 4th house is the main house of land and real estate. For any work related with lands, it is important house. 8th house – It is house of digging underground. For anything related with farming or construction, 1st you need to dig the land. Hence, 8th house becomes important. 10th house – 10th house is main house of work or career. Its association with these other houses can lead someone into farming or land related Career. 12th house – It is house of isolated places. Now, if you want to start your agricultural farm or even build an apartment, you have to take land away from populated area as you can get it on cheaper rates. Taurus – Taurus is the sign of Assets. As Land is also an asset, Taurus becomes important here. Cancer – For being 4th sign, it has the same energy as 4th house. Virgo – As it is 6th sign and represents the energy of 6th house of dealing with obstacles and hard work, it is an important sign. Any work related with land involves lots of hard work and facing obstacles heads-on. Scorpio – Again, for being the sign of digging deep into underground things, it is important. Capricorn – The sign of hard work and perseverance. Again, these qualities are much required in any land related work. Mars – It is the main karaka of land and real estate. Saturn – It represents hard work, perseverance and repeated efforts. Ketu – It is about digging deep into things. Chitra – As its deity is Lord Vishwakarma, the divine architect, it is the most important nakshatra for any land related work. Moola – For digging into ground, Moola and Ketu energy is necessary. Sravana – Due to mythological story where Vamana incarnation of Lord Vishnu asked for land equal to his 3 steps. Various Combinations - Now, any combination between these houses, planets, signs and nakshatras can make someone work in real estate, land or farming field. Any combination between these planets, houses, signs & nakshatras where energy exchanges between them will be enough to create such professional in proper dasha time. Atma Karaka or Amatya Karaka - If Saturn-Mars becomes person's Atma Karaka or Amatya Karaka, then things can be more prominent to become someone involved in real estate or land related work. Mahadashas - But as always, dashas will activate houses or planets and person will have realization at that time to take up such a Career. Aquarius Ascendant – A sign of entrepreneurship and serving humanitarian causes. So, he is supposed to serve people through his own work. Saturn – Ascendant lord Saturn is in 8th house/Virgo of underground things and digging deep into lands. Saturn is with Mars which represents Lands. Saturn is in Chitra Nakshatra only. Saturn also rules the 12th house of isolated places and he got a land far from the main city area for farming work. Saturn is also his Amatya Karaka. As Saturn was involved everywhere, things happened for him only after immense hard work, perseverance and delay. He had to put repetitive efforts to get the proper land for his farming work and get things started. And again, as Saturn was involved everywhere, not a tough guess that things turned this way with the start of Saturn MD in 2016. This is when he quit his job in corporate and started working for his own work of organic farming. 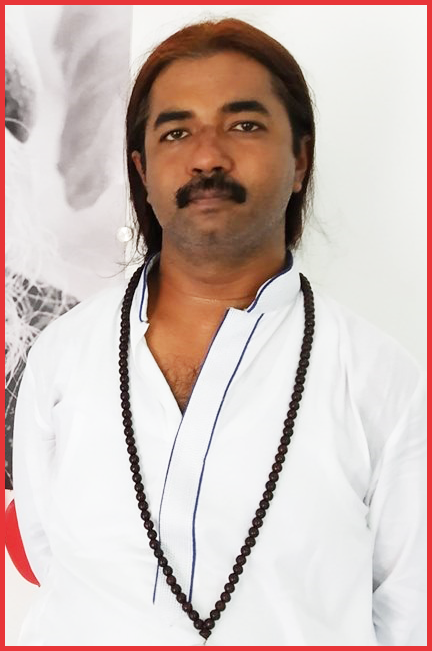 As he is still in Saturn-Saturn dasha till May, 2019, he still has to put his best efforts repeatedly to keep things moving. 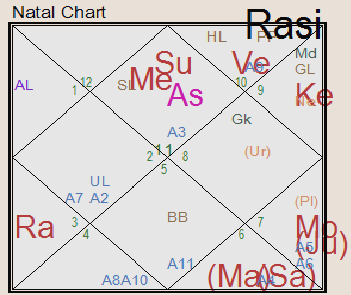 Once he enters into Saturn-Mercury dasha in May, 2019 and Saturn leaves his 11th house/Sagittarius of income during annual transit in Jan, 2020, then he can expect some returns to come his way and income to improve. As always with Saturn, it gives you results only after delay, hard work and perseverance. All the best.